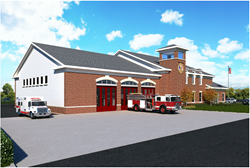 Franklinton based Palmetto Construction is pleased to announce that it has been selected to build the new $4 million dollar Fire Rescue Station for Truro Township. The new station will include an approximately 16,000-square-foot building that will accommodate three bay areas, furnished dormitories, kitchen, gym, bathrooms, community room, storage and back-up power. Safety is an important feature that both Palmetto Construction and Truro Fire train on and place as a first priority. Moody Nolan Architects is providing the design and engineering for the project. Palmetto Construction Services is a full service general contractor serving the commercial and industrial industries. Having constructed over 500 projects, primarily for repeat customers, Palmetto has established itself as an industry leader in design/build, construction management, and general construction services, through self-performing much of the work themselves. Palmetto Construction has offices in Columbus and Tampa. For more information, please visit http://www.palmettobuilds.com.